CANE GARDEN BAY, Tortola, VI - A massive protest march, slated for Friday June 8, 2018, dubbed the ‘Peoples March,’ continues to gain support from influential Virgin Islanders—the latest lending support to the cause, Senior Pastor of the Cane Garden Bay Baptist Church, Reverend Dr Melvin A. Turnbull. The march follows a call by political candidate, businessman and former Permanent Secretary, Julian Willock, on at least two religious leaders to take up the challenge. 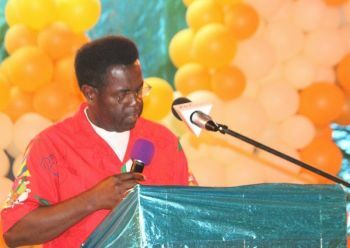 Deputy Governor, David D. Archer Jr., has since also reaffirmed his support for the constitutional rights of Virgin Islanders to take part in the march but cautioned public servants, to seek permission first. 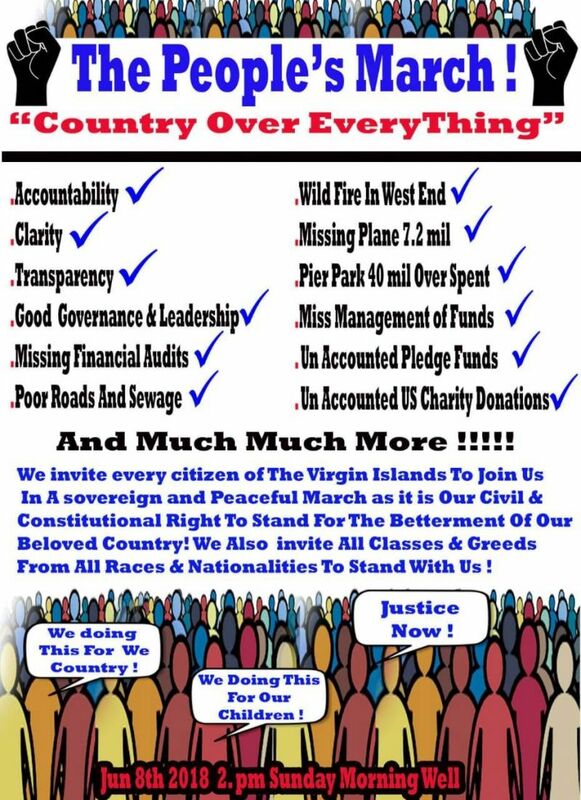 The People’s March is set to start from 2:00 PM from the Sunday Morning Well where residents will proceed to the Central Administration Complex, demanding accountability for millions of dollars in government funds unaccounted for, or wasted, in addition to other pressing domestic issues. your mind pastor! Thank GOD you’re not like some who puff-up extra loud only when there is something in it for them. is the best policy,” that’s all we want from this government party. We want the truth. The Peoples’ March. C-mon, I respect this man. 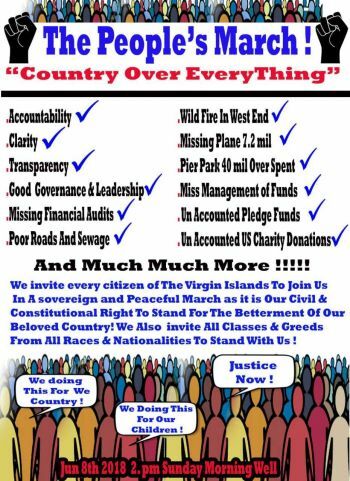 the charity the billionaire was spearheading in the name of the BVI; what is the position on that? All of a sudden he come out in the limelight. I wonder if this is to trump the first one. Ego is s dangerous thing!!! Watch Out!!! We have already had a march for the individuals who fear for the loss of privilege and power associated with the easy money of financial services. Now we will learn if there is any genuine consern for the loss conscience and credibility associated with continuous overspending, corruption and incompetence of our government. The people’s march may not have the dynamic NDP marketing machine behind it but the questions being raised are fundamental to who we are as people and what kind of community we intend to build for our children whether there is a financial service industry or not. It is some of us that have the same Government overspending. Who you think they overspending on? Local contractors who over price everything and when they can’t get the jobs we curse the same Government and threaten to vote them out. Ignorance is bliss. Corruption? Really? You overstretched. The Governmebt has made some bad decisions. Every Government perhaps have them. BVI Airways was a huge blunder but corruption assumes some one in Government benefitted from the money. When the cruise pier was going to build for a reasonable cost we protested against the terms. Since then the Government was not upfront about the real cost of the project for fear of more protests. The Cruise pier had overruns but I doubt it was 40 million. We voted them in. The way we deal with our own decision is to make another one. The UK Decision was handed down to us. We did. It make it. That’s why we protest. The march tomorrow is against ourselves. That Government reflects us. It’s of us and by us and if we want good Government then perhaps we need to become good people!!! Now I know it's a political march people, this dude just upset because of how the neo treats his son. This is the eternal competition. It never ends it seems. Cline was successful at a march so now everyone wants the same glory. Lord see for us. This Pastor should stay out of politics and look at ways to help improve the communities where government has failed. I think we would benefit more from an organized volunteer cleanup of litter and old cars, furniture, appliances, scrap metal, tree trunks, bush. You name it. The Pastor can use his influence here. After the hurricanes I saw Caucasians set up a soup table for all people with children. They did not look rich to me. On the other hand I saw well to do brown people pushing in the lines for gas. The Pastor could write a sermon on this amazing difference in behavior and stop promoting civil disorder. Church and State should stay separate. Where in the Virgin Islands constitution states that church and state should be separate? This is not America budd. IS THIS THE GOVERMENT MINISTER OR THE SON? WHATS GOING ON HERE? I have a new level of respect for Pastor Turnbull. What happen to all the other community leaders and political aspirants who were supposedly speaking out publicly against all the wrongdoings? Politics and religion are appear to be good friends.. Stay tuned for next week's exciting episode. I suppose he is influential over his own family and congregation.I don’t know who else. Certainly not me and my family.